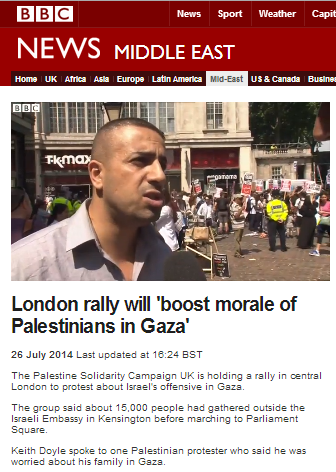 The next time the opaquely funded, Hamas supporting, Palestine Solidarity Campaign complains about supposed BBC bias in favour of Israel (and let’s face it – that won’t take long), it may be worth reminding them of an item which appeared on BBC television news on July 26th and was also promoted on the BBC News website’s Middle East page under the title “London rally will ‘boost morale of Palestinians in Gaza’“. In that report on a rally held on the same date in London (at which antisemitic imagery and messaging were in open use, although there is no reporting on that in this item), presenter Keith Doyle interviewed Yousef al Helou – currently a Reuters Journalist Fellow at Oxford University. Doyle made no effort whatsoever to counter the inaccuracies, falsehoods and propaganda spouted by al Helou, who claims not to be a Hamas supporter but all the same seems to have no qualms about doing a speaking tour for the PSC which does support and enable that terrorist organisation. That barrage of uncorrected falsehoods and context-free distortions was brought to millions in the UK – at a time when antisemitic attacks are on the rise in the UK – by the media organization which claims to adhere to standards of accuracy and impartiality. Palestinismis neither a just cause nor a universal cause! Unless one calls islamo-nazi and left wing nazism a universal and just cause!!! The only definition that fits them is PROVOCATION and mystification. The problem is that democracy cannot fight it because it does not understand one fights provocation only by…PROVOCATION! Who is a Semite’? People coming from a region in S. Asia? Does Ishmael, being fathered by Abram include him? And while on that subject “Who is ‘Aryan’ “? Who are “Caucasians’? from the Caucasian Region? Say “Aryan-Iranian” three times, fast. What do you hear?